The bathroom was completely gutted. All surfaces and finishes were replaced. Mary & Robin are a married couple who’ve lived in the condo for more than 20 years. Our boomer-aged clients are both professionals and are healthy and active – they are avid sailors belonging to a local Yacht Club. This is the main bathroom in the condo – it is used by the homeowners and any guests or visitors. The structure of the bathroom was sound, it needed an update, it was really ‘stuck in the ‘80’s’. The clients’ realized that if they converted their bathtub to a walk-in shower it would help them to remain in their home longer. It’s much easier to step into a shower than a bathtub – allowing them to ‘age in place’. The bathroom was completely gutted included removing the bathtub. The bathroom is now very fashionable and even more functional. We used Anthology Beige 12” x 24” porcelain tile on the wall of the shower. We used Anthology Brown 12” x 24” porcelain tile on the floor and Anthology Brown 2” x 2” on the shower floor. 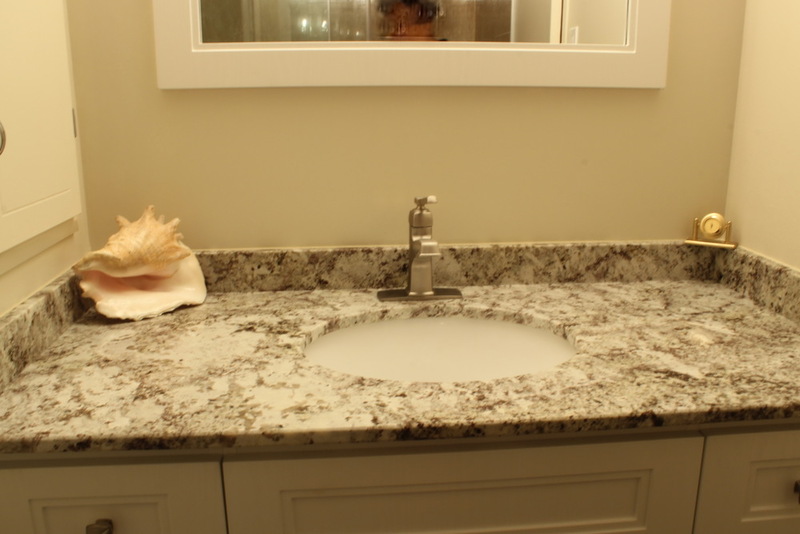 The vanity and mirror were custom made and we chose Ice Brown Granite for the countertop.